Please send me more information on Cabo Adventures - Sea Tours! 3 for 2! – pay for 2 adventures and third is free! 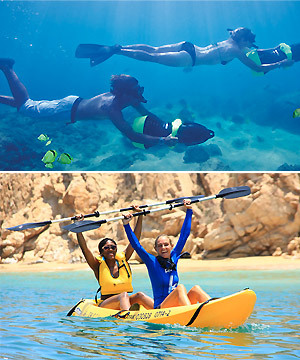 The only snorkeling tour in Cabo San Lucas and San Jose del Cabo that combines power snorkeling, kayaking and an Apex boat ride, the Snorkel & Sea Adventure will help you discover why Jacques Cousteau called the water’s around Cabo “the world’s aquarium”. Have an up-close look at the famous Land’s End arch and the Lover’s Beach, go beyond the hotel zone and explore beautiful secluded coves and isolated beaches. 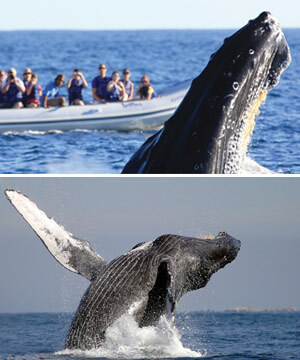 Be educated on the area and Cabo’s sealife – including dolphins and humpback whales (whale sightings mid December - mid April). Power-snorkel with water scooters and kayak in the clear water while looking for rays, sea turtles and tropical fish with a guide at your side keeping you safe and teaching you about the sea-life you observe. Children ages 5-14 must be accompanied by an adult. play host to one of Mexico's top diving destinations. Professional diving instructors combine their expertise with the utmost personal attention in scuba lessons for every level of certification. 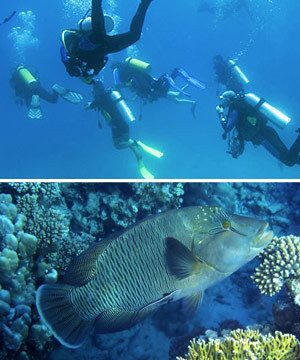 Whether you are a beginner or a certified diver, this is a fun, safe and exciting day you'll never forget. Water, snack, towels, wetsuits, tanks and all diving equipment. Different tour times are available upon request. A photo captures a single moment in time, and this specialized whale watching tour is designed to capture the magical moment when you encounter wild dolphins and majestic humpback whales in the Sea of Cortez. The essence of the Whale Watching Photo Safari is to find the wildlife and enjoy those precious moments when you can sit peacefully and watch the whales and dolphins play, breach, or just hang out. Conducted on new all weather inflatable speed boats to ensure a safe and comfortable ride, Whale Watching Photo Safaris are guided by exceptionally talented marine mammal behavior experts who are passionate about protecting wildlife and the environment. As you track and watch the whales off Los Cabo, the professional guides' knowledge and insight will give you a deeper understanding and appreciation for the wildlife that you'll encounter on this unforgettable whale watching experience. The minimum age for this tour is 5 years. This tour runs from 12/15-04/15. Highly experienced marine biology expert, underwater hydrophone, light snacks and bottled beer. The Sea of Cortes adventure is an opportunity to experience one of the most beautiful places on Earth. Step aboard our Luxury yacht and prepare to be immersed in breathtaking beauty and natural wonders; it is truly the adventure of a lifetime. Named by famed Jacques Cousteau as “the world’s natural aquarium”, the Sea of Cortes is the 700-mile-long body of water embraced by mainland Mexico and Baja California. Expert guide, breakfast, deli-style lunch, bottled water, national open bar (served after snorkeling), towels, snorkel equipment, and roundtrip transportation. Whether you are a seasoned sailor or someone looking to try sailing for the first time, our luxury sailing experience is like no other in the Sea of Cortez - a marvelous blend of colors and marine life in Cabo San Lucas. We have more than 15 years of experience taking guests on amazing sailing day trips; we know how to perfectly mix luxury and adventure to create a fantastic day on the water. Join us as we explore Baja's spectacular coast, dropping anchor in stunning coves to enjoy the warm, clear waters or simply relax. Snorkel, see marine life or just enjoy the views. Professional and friendly crew, snorkel equipment, SUP boards, towels, unlimited national premium bar, a fresh, delicious menu, bathroom and shower. Cabo San Lucas is famous for its beautiful sunsets, and there is nothing more peaceful and romantic than sailing the waters off Cabo as the crimson sun dips into the deep blue waters of the Pacific. 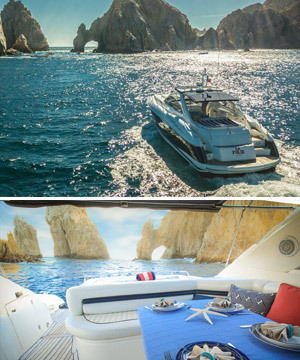 Just imagine - the sun is setting as you relax in comfort on deck, cocktail in hand with the wind pushing you across the crystal waters of the unique place where the Pacific Ocean meets the Sea of Cortez. 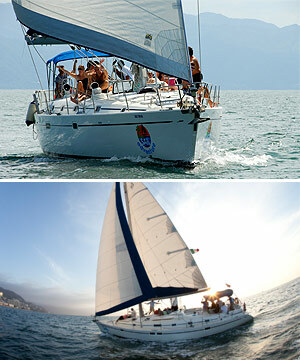 Professional, friendly crew, unlimited national premium bar and a fresh, delicious menu and bathroom on board. 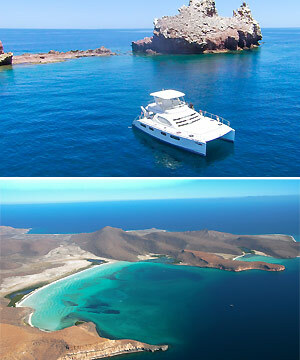 The Private Yacht Experience provides top shelf service while cruising the scenic coastline of Los Cabos. Days can be spent onboard exploring well known landmarks like the famous Arch, Land’s End and the attractions of the Sea of Cortes, or simply relax while enjoying cocktails on the sun deck as the sun dips into the deep blue Ocean. We invite you to savor a truly unique a once in a lifetime experience in the Pacific Ocean and Sea of Cortes, while enjoying premiere all-inclusive accommodations. Professional and friendly crew, snorkel equipment, SUP boards, towels, unlimited national premium open bar, a fresh delicious lunch menu. There are few experiences in the world that match swimming alongside the largest fish in the sea - especially when that fish is a shark! 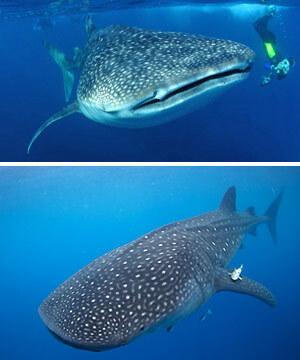 But don't worry: these whale sharks are known as "gentle giants." Give us a day and we'll take you out of Cabo to La Paz for an adventure of a lifetime. You will cruise out of Cabo in comfortable, air-conditioned vehicles on your way to La Paz. Upon arrival at our facilities, your guides will take you out to encounter these magnificent creatures in the clear waters. After your visit with the Whale sharks, head back to La Paz and relax on the city's Malecon (boardwalk) and indulge in a local lunch of "Baja-style" tacos and cold beverages. Enjoy strolling around La Paz before heading back to Los Cabos. Round trip transportation* in an air-conditioned vehicle, expert guide, driver and photographer, snorkel equipment, towels, wetsuits, Baja style lunch, non-alcoholic beverages, bottled water, 1 hour free time in La Paz, visit to a local marine museum, stop at the famous Hotel California in Todos Santos. 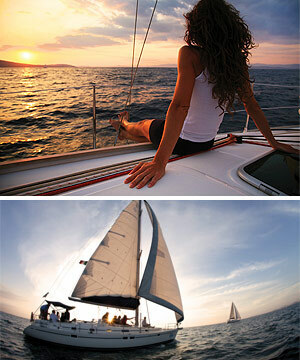 Are you ready to try the coolest and most exciting adventure water sport? Want to experience what is like to fly out of the water like Ironman? Then you have to try Flyboard! 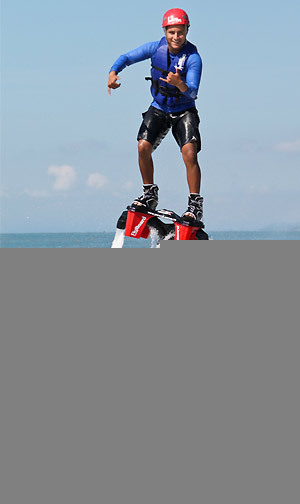 Flyboard is easy to learn and really fun right from the start. Our instructors are professionally trained and have one goal: to make sure you have a fun and safe time. Don’t miss your chance to try this amazing activity. Can Anyone Do It? Of course you can do it! Flyboard may look a little extreme, but it’s not. Guest of all ages have taken to flight and had a great time: men and women, young and old. It is the perfect tour for families with teens or anyone looking for a new adventure. What is Flyboard? Flyboard is 100% fun and full of thrills! Only three years old, it takes the power of a Wave Runner and redirects the thrust to the Flyboard to lift it into the air. Providing almost 400 lbs. of thrust, this thrill-a-second ride will get your adrenaline pumping. Once you fly, you will be hooked! *Transportation available from select locations; ask your Cabo Specialist for more information. For all tours arrive 30 minutes prior to your tour. San Jose location: Paseo Malecon #512 near Hotel Zone, Dolphin Center. Cabo San Lucas location: Blvd Paseo de la Marina, Lot 7a, Cabo Dolphin Center.